Free paperback book + 5-part Entrepreneur's Solution online course ($214 value). Skillbuilders, worksheets, and exercises that follow the book ($97 value). 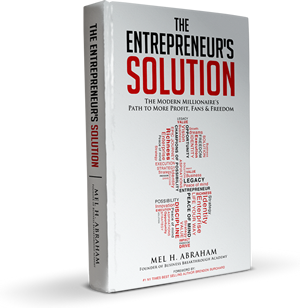 Free direct access to Mel in the private Entrepreneur's Solution Facebook Group. *The Entrepreneur Solution retails for $17.95, but we bought it for you. We just ask that you pay your shipping/handling to receive it (just $7 anywhere in the world). Your information is secure and will not be rented or shared, ever. © 2015 Thought Leaders IP, Inc. All Rights Reserved.